This is Lovetta Conto. She’s 16 years old, and I just got something from her that I treasure. Bringing her tree imagery to life, Lovetta has created wearable art that I love. 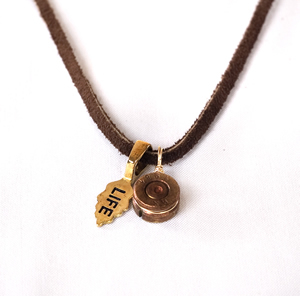 The Akawelle necklace (AKA=also known as, WEL’LE=love) has two parts: a small leaf pendant stamped with the word “LIFE” and a round pendant that is the bottom of a spent bullet casing. The leaf pendant is also made from the melted casings of bullets. The area of Liberia where Lovetta is from was riddled with bullets—there were places where so many fired and discarded casings littered the ground, you would have to shuffle to avoid stepping on them and slipping. They were like fallen leaves covering the earth. The war ended in 2003, and still, spent shell casings can be found all around. The bullets are collected for Lovetta by a man in her former region who splits each one open by hand. She buys the bullets from him for her jewelry and he uses the money to keep his kids in school. 100% of the profits from Lovetta’s Akawelle necklaces goes to the Strongheart Fellowship and the Strongheart House, a home and healing shelter in Liberia for children orphaned by war and other circumstances. I wear mine every day. How do I buy them?! It is simple–and I hope you will. Just click the “Akawelle” link here in the posting, that will take you to her web page. There, you will find a link that says “The Jewelry: View the Akawelle Necklace, Place an Order.” Then you can shop–some come on sterling silver chains, some on a cord, like mine. Enjoy!